I've got a client leveraging Flash's integrated webcam capability. By default, Flash requires user explicitly click Allow to enable the webcam (which is a good thing!). There's a number of ways to allow users to start up their webcam automatically, which is something my customer was doing great. And this was working great for them. And then it would stop working. It seemed that no matter what they did, they couldn't quite get this setting to stick. And from looking at this file in notepad, I could tell the "Always" accept option seemed to be set. Yet, every time we restarted Internet Explorer, this directory was deleted. My first thought was that I could set the permissions on the file to make it undeletable. That was a bust. I may be a professional programmer and all that, but apparently I don't have the skills in logic to understand Windows XP permissions. After a good night sleep, I attacked the problem again today. 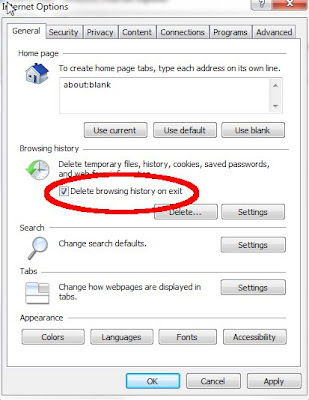 While describing what I understood to be going on to the customer (some file is being deleted), she mentioned to me that she had configured IE to remove history when it exited. And of course, this was it. I unchecked the box, and the settings file no longer disappeared. 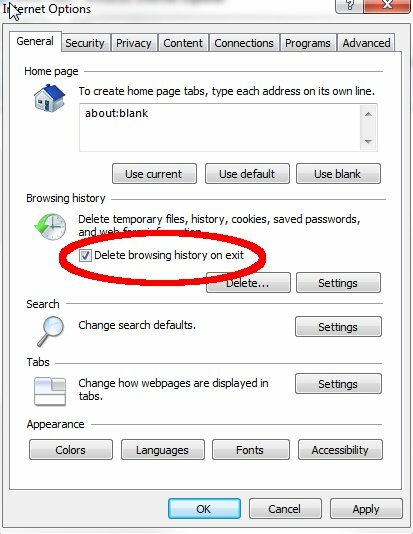 I would have assumed that checking the box to delete browser history would have done that -- removed the list of sites you've visited. But, apparently, Internet Explorer is a bit of an overachiever in this department. At least Internet Explorer was behaving somewhat logically, that's more than you can usually say about it.